Data Natives, the conference focused on how data is driving the future through the Internet of Things, Big Data and FinTech, takes place in Berlin November 19 – 20. Editor’s note: This is a sponsored article, which means it’s independently written by our editorial team but financially supported by another organisation, in this case, Data Natives. If you would like to learn more about sponsored posts on Tech.eu, read this and contact us if you’re interested in partnering with us. 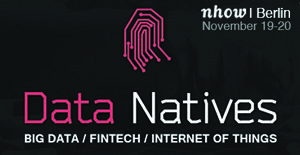 Data Natives, the conference focused on how data is driving the future through the Internet of Things (IoT), Big Data, and FinTech, takes place in Berlin November 19 – 20. The event founded by Dataconomy takes place at the nHow Hotel in Berlin and will bring together speakers and attendees – multinationals, academics and budding startups. Over the two day event more than 50 speakers and 300 delegates will be in attendance while six startups will compete in the Data Natives Startup Battle. Some of the speakers taking to the stage include: Jeremy Waite, Head of Digital Strategy EMEA, Salesforce and 2015’s #1 Onalytica Big Data Influencer; Yuval Dvir, Strategy Head of Global Product Operations, Google; Suzy Moat, Associate Professor of Behavioural Science, Warwick Business School; and Duena Blomstrom, Fintech and Innovation Consultant and Mentor at Startupbootcamp and Techstars. Talks and panel discussions will pick apart the state of the data industries and the impact they are having on sectors like healthcare, ecommerce, marketing, and banking. Delegates will see how data science can disrupt not just billion dollar tech companies but a single consumers’ experience too. In addition, over the two days there will be a series of workshops for a hands-on experience in learning and absorbing the opportunities that data presents. Some of the workshops already announced include the use of Python for financial data science and an introduction to lean analytics. View the full schedule here with more talks and workshops set to be announced soon. The areas of Big Data, the Internet of Things, and FinTech are complex and ever-changing. Data Natives will be addressing the opportunities and challenges in these industries moving forward. Attendees are encouraged to build new relationships with those working in data and seek ways to make their business more data-driven, identifying new opportunities to grow their business and following. Due to the strong line-up of speakers and growing interest in the Big Data industry early bird tickets have sold out. Regular conference passes and VIP conference passes are still available. Follow Data Natives Conference on Twitter at @DataNativesConf to stay up to date on conference news and discounts. Click here for more information on pricing.